like to view larger jobs and heavy repairs, but are happy to do single rooms and hallways without first viewing, sending a photo helps a great deal. Is the process dust free? – We use 95% dust free machines for the majority of the process, but fine sanding on the finish can cause a little dust, we make every effort to hoover up all remaining dust before we varnish. well they can mask up, one spill can ruin the finish. Skirtings do get marked and will need re-touching. As a standard how many coats or varnish to you apply? varnish or 2 coats of hardwax. 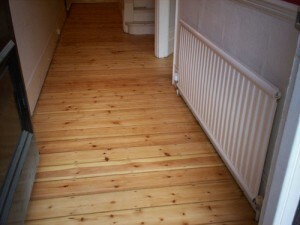 Can you fill all the gaps in my Pine floorboards? – We can if we feel the filler has a chance of holding. Can we see a sample of stain colours? – We approve stain colous on site, on the actual floor, our stain charts give you a guide. Is Hardwax a good idea? – It looks and feels great, brings out the real beauty and lustre in the wood, but does require routine maintenance.What is waterbourne seal? – Its waterbased Polyurethane, comes in finishes of Matt, Satin/Slk and Gloss. We apply 3 good Coats. Can you remove a firehearth in my bedroom? – In Most cases yes. We blend in the repair with reclaimed floorboardsHow long roughly should it take to complete projects? – If you allow a day per room then that will give you a rough idea. Do we need to clear all furniture before you arrive? – Yes, usually our prices are based on working from a clear room unless specified. What Products do you use? – Generally we use the Junckers range on our commercial projects and Granwax for Granwood floors, Granwax have been in the flooring business since 1912, based in the UK, they offer the highest quality chemicals with the lowest VOC content in comparison to any other manufacturer in the world. We also use Bonakemi, Blanchon, Osmo and Blanchon Hardwaxes. Can you provide references? -We have a long list of very satisfied customers and are happy to give details of our most recent ones on request. Do you take away all the sanding debris? – Sorry we can no longer offer this as part of our service, Our vehicles are not licensed to carry waste, and believe it or not we would actually be breaking the law. We will leave all debris suitably bagged for your disposal. Is it true that its easier to sand and finish a wood floor without staining? 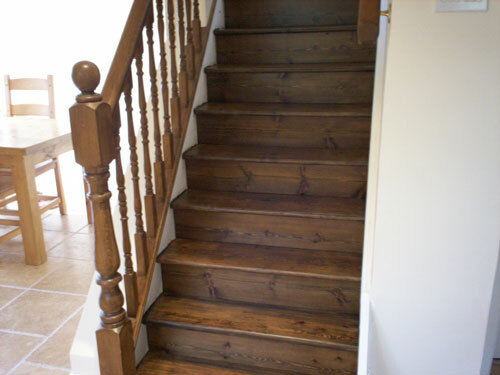 – TRUE, preparing floors for staining requires more attention to detail and extremely even sanding, as colourings will show of any imperfections, where as a clear natural finish does not. Staining floors is not that difficult itself, the key is in the preperation thats needed to get good results, 70% of our jobs are stain and colouring jobs, Company’s offering sand and seals only are probably not competent enough to offer this service as it envolves so much more finishing and attention to detail than simply sanding and varnishing. Excuses our customers have heard lately from other companies are: “You can’t stain pine”, “Our stainer has left the country for two weeks”. Any professional floor sander worth there salt should be able to prep a floor for stain, No excuse. What woods are difficult to stain? – In my experience i find Maple and some poor grades of beech extremely hard to stain without getting blotcheness, Dark woods can only be stained darker.